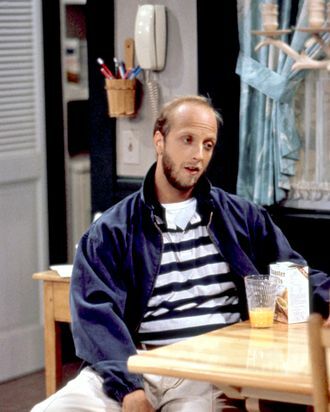 Twenty years since going off the air, Chris Elliott’s cult classic anti-sitcom Get a Life, about a failure-to-launch 30-year-old paperboy who is quite possibly psychotic, has finally been compiled as a complete DVD set. But even diehard fans who marathon the whole series and all of the extras in one sitting won’t learn everything humanly (or inhumanly) possible about the show, which was cancelled in its second season despite being the highest-rated new comedy on Fox its first season. For trivia the ultimate fan might crave, we turned to Get a Life’s executive producer David Mirkin, who was happy to share with Vulture a few choice tidbits not commonly known about the series, its writers, and its viewers. 1. Fox execs thought the episode “SPEWEY and Me” was too disturbing to air. SPEWEY (which stands for Special Person Entering the World, Egg Yolks) was a perverse twist on family-friendly extra terrestrials such as ALF, E.T., and the knock-off from Mac and Me. This putrid and violent creature, true to his name, would spew, spit, and projectile puke his guts at you, just out of spite, but Chris falls in love with him and takes him home. Fox’s main bone of contention was that Chris and his friend Gus end up eating SPEWEY: You can’t eat him! Mirkin was told. “But we wrote it so they can eat him,” Mirkin said. “That was the whole point of the story, and it was beautiful because he regenerates from his own leftovers. So it’s a bit of a Christ story, and it gives people hope.” Fox “reluctantly relented,” Mirkin said, but it was a lesson for him in how the network couldn’t always visualize what was coming based on the scripts. 2. The show was actually packed with special effects. 3. John Malkovich was a fan and wanted to guest star. 4. Chris moved out of the house to accommodate his real-life father, not to appease the network. 5. The opening sequence was an accident.